Apologies for the lack of posts these last few weeks! I hope that you all have had a wonderful Christmas and New Year. I also hope that there were a lot of lovely things to eat and drink. We (the other half and I) spent Christmas with my family in Wales. None of us really like Christmas pudding so I offered to bring something baked that we could all have with a post lunch cup of tea. I thought it was probably best to do something I'd made before so did a batch of Red Velvet Cupcakes. A bit of indulgence and a chance to use my edible red glitter! And the finishing touch, edible glitter! To decorate: edible glitter, coloured sprinkles...anything you'd like! Using a hand-held electric whisk or a freestanding mixer, cream the butter and sugar together until you reach a fluffy consistency. Break in the eggs one at a time. Beat thoroughly after each egg and make sure to mix in the mixture from the sides of the bowl. 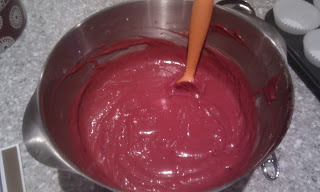 In a small separate bowl, blend together the cocoa powder, food colouring and vanilla essence until you get a paste. Then add the paste to the mixture, mixing thoroughly until everything is incorporated. Sift the flour and salt together in a separate bowl and add to the cake mixture in two portions, alternating with the buttermilk. Ensure you mix thoroughly after each addition. Finally, mix together the vinegar and bicarb (watch for the fizz!) and add it to the mixture and do a final mix (ensure you get in all the mixture from the sides of the bowl). Spoon the batter into the paper cases so that they are two thirds full. The recipe makes 12-16 cupcakes. Place in the oven and bake for 18-20 minutes. 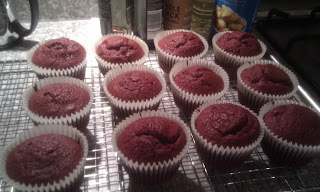 Allow the cupcakes to cool for a short while in the tin, cool on a wire rack before you ice them. Using your whisk or mixer, beat together the butter and icing sugar until there are no big lumps of butter left. Add the cream cheese and mix on a slow speed until well blended. Then turn to medium speed and beat until light and fluffy. Cover all but one of the cupcakes with 2 tbsps of the icing, smooth down with a palette knife and make a swirl in the middle for a decorative finish. Place the remaining cupcake in a food processor and blitz until you have fine crumbs. 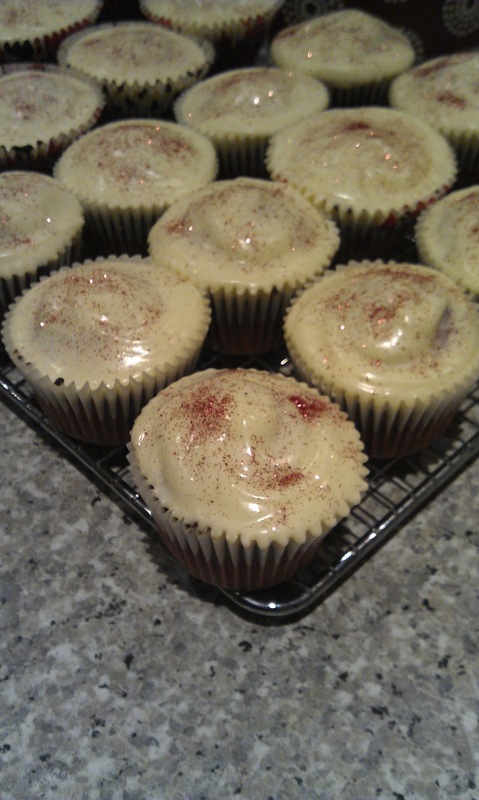 Sprinkle the frosted cupcakes with the red crumbs. Or use sprinkles. Or glitter. Or whatever you prefer!